As the U.S. Navy began retiring the S-2 trackers in the late 1970's, private contractors like Hemet Valley Flying Service, Aero Union and San Joaquin Helicopters converted these planes to aerial tankers. In 1973, CDF (California Department of Forestry and Fire Protection) tested an S-2 Tracker out of Hemet, CA, it was Tanker 71. The tank was built by Hemet Valley Flying Service. It was loaded from the side and had a rather "boxy" look to it. Only one other tanker was built like this-T-70. 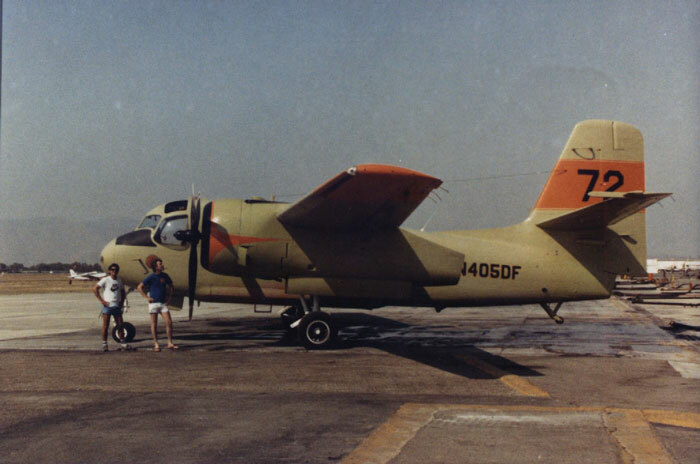 In 1974, CDF began putting additional S2's in service with the termination of single engine airtanker use TBM and AF2S guardians. The tanks were built for CDF by Aero Union in Chico, California. They fly P-3's, Neptunes and DC-4's now. Beginning in 1974, three different color bands were applied to the tankers based originally on who was the contractor. Orange was used for Hemet Valley FS; Green was for Sis-Q Flying Service; and Blue was applied to Aero Union contracted S2's. Over time this idea kind of faded and eventually all of the S2's were repainted with the orange bands-I believe for visibility. They could be hard to see sometimes with the green and blue bands. The early 90's brought in the red and white paint scheme you see today. There was one (T-77) that had a white with orange paint scheme. The test turbine (T-180) was also painted this way. It is now sitting in a Mesa Arizona bone yard less engines. Tankers 70 and 72 in the summer of 1985 at Hemet Ryan Airport in Southern California, in Riverside County. Tanker 72 had just completed a drop on a fire and tanker 70 is running up engines. The Arial photo was taken above Hemet, from a PA-28-181 Cherokee Archer, piloted by myself. These shots courtesy of Mr. Dustin Berg shows the Stoof in the old colors (1988) and the most recent paint scheme for the S-2A. Ramona Air Attack Base, located in Southern California, now has two turbine models based there and was one of the first bases to get these, due to the higher density altitude. Tankers 73 and 95 in the summer of 1999 at Ukiah Air Attack Station in Northern California. Despite the 100 degree plus weather, it was a very quiet day. All of the above sequence, except for the last three photos were taken October 14, 2000 at the Hollister Air Attack Station with my new Kodak DC-3400 Digital Camera. Tankers 80 and 81 were dispatched due to a car fire near the brush, took off and were recalled a short time later. The last three were taken from an R.C. Model Field, a few miles from the departure end of the runway and the observation tower at the base. On October 21, 2000, we visited the CDF Maintenance Facility. During the off season, all S-2 Trackers in the system are worked at Mather Airport, near Sacramento. Tanker 100 has had the tank removed for maintenance and tanker 92 is in from Chico, California. The fire season was still in full swing, due to strong and dry northeast winds in the Sacramento Valley and San Francisco Bay Area. The above sequence was taken on January 23, 2002. At this time, the CDF has about 50 percent S-2A and S-2T models for the 2002 fire season. The tankers are inspected and the necessary repairs are made, before they are returned to their bases for the summer. On June 16, 2001, Columbia Airport hosted their annual Fly-in Airshow. The CDFFP was scheduled to demonstrate an air drop with Tanker 83, a Turbo Tracker. Due to very hot weather and high fire danger in the region, Tanker 96, a Piston Tracker was brought in as a spare in case a tanker was needed for a wildfire. Tanker 83 was called upon twice, while Tanker 96 waited on the tarmac. When it was time for the demonstration, both the Turbine and Piston Trackers flew, to the delight of the crowd. The OV-10 Bronco also flew and the UH-1 Huey demonstrated a water drop with a bambi bucket. The tankers did not drop, because they were on a ready status in case of a wildfire. On July 4, 2001, we visited the Redding Air Attack Base. Although the temperatures were hovering near the 100 degree mark and Independence Day increased the fire danger, it was surprisingly a very quiet day. Redding Air Attack Base is one of the most modern stations in the system. It was completed in 1987. Because Redding is situated in the valley and has a long runway, it will keep the round motors there, until they are completely phased out. This sequence shows Chico-Based Tanker 92, which was off duty for the day on 12 August 2001. During the off time, this was a great opportunity for the Technician to fix any discrepancies. Tanker 92 continued service the following day at Grass Valley Air Attack Base, working the Emigrant Gap Fire (see next sequence). Tanker 81 also arrived and departed the same day. This is Tanker 74 and 75, the way they looked in the 1970's and 1980's. Note the Hemet-Valley logo on the nacelle. At the time Hemet-Valley Flying Service had the contract for these aircraft. The Emigrant Gap Fire broke out on Sunday, August 12, 2001 in the Sierra Foothills east of Sacramento. Four air tankers were working this incident, two radial engine S-2's and two turbine models. The two aircraft shown here are Tanker 92, based at Chico and the former Tanker 73 out of Hemet, which was replaced with a turbine model and utilized as a spare. Thanks to DeeAnn Bradley, William Larkins, Angie Moebius, Dennis Danzl, Rick Ouellette and wildlandfire.com and for their contributions to this sequence. Please visit the wildlandfire.com website to see more photos of airtankers. Thanks to Mike Lynn who provided the museum with these magnificent shots.